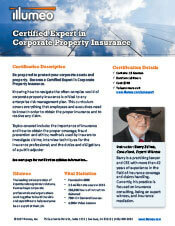 A comprehensive corporate property insurance certification program. Why get a Corporate Property Insurance Certification? Major topics of study include, but are not limited to: the importance of insurance; how to acquire insurance and understand an insurance policy; the methods used by insurers to investigate claims, including first-party property claims; the various types of insurance that corporations need; the duties and obligations of a public adjuster; and how to present a claim that will be paid. The Corporate Property Insurance Certification program brings all this and more. Barry Zalma, Esq., CFE, is an internationally recognized expert on insurance, insurance coverage law, insurance claims handling, and insurance fraud. He now limits his practice to service as an insurance consultant and expert witness specializing in insurance coverage, insurance claims handling, insurance bad faith and insurance fraud almost equally for insurers and policyholders. He also serves as an arbitrator or mediator for insurance related disputes. Mr. Zalma practiced law in California for more than 44 years as an insurance coverage and claims handling lawyer and served more than 50 years in the insurance claims handling, policy interpretation and insurance coverage business. In 2016, Mr. Zalma is the first recipient of the first annual Claims Magazine/ACE Legend Award. This course offers a detailed overview of the concept of "excellence in claims handling" requirement for all insurers.